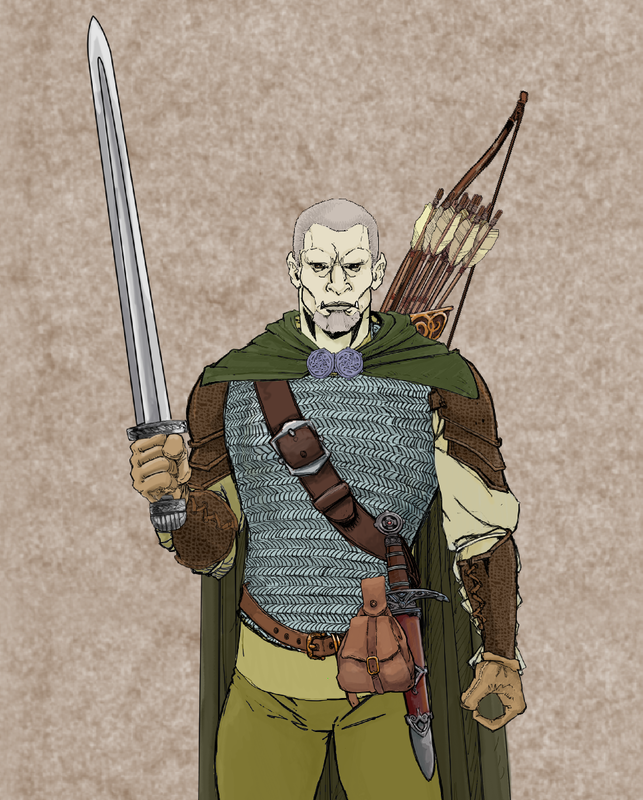 As promised, here is my first 13th Age character, a half-orc fighter created to match the character portrait I created for the February Annual Challenge. Several key things that need to be created for a 13th Age character are: a One Unique Thing, Backgrounds, and Icon Relationships. 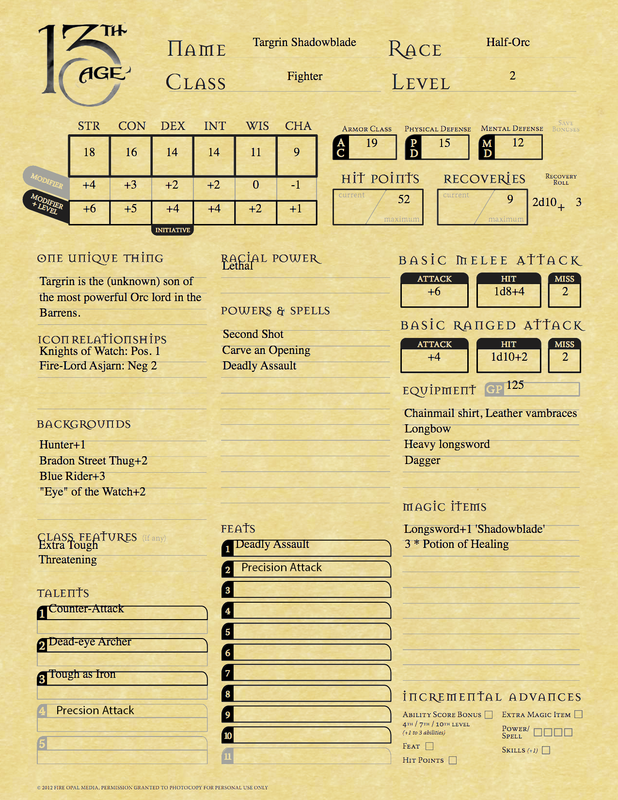 These items are discussed in my previous post on the RPG, and are critical to investing the character in the campaign world and story. Below you can find the background story that I developed, and the mechanical items that derived from this. It’s hard to know whether the story came from the mechanics, or the mechanics were derived from the story; but that’s the beauty, in a sense they drive each other, with great results! The birth of a half-Orc nine months later was a great shock to the people of the village, who wanted Targrin put to death. His step-father (a hunter who had been away from the village on the day of the raid) and mother resisted however, as the difficult birth meant they would not have other children. Ostracised by the backwards village folk, they lived in a small stone cottage in the hills, where his step-father hunted and sold meat and pelts for a basic living (Background: Hunter +1). When Targrin was 10 however, his step-father was killed by a great wolf. Knowing they would be unable to survive the winter alone, but fearing to return to the village, his mother took them south, where they eventually ended up in the poor quarter of the town of Bradon. Here, Targrin’s humanoid heritage was, if not common, at least ignored by most, certainly within the back-streets and slums of the bustling mercantile town. As he grew older, it was only natural that with his height and bulk, as well as his relative lack of other prospects, would lead directly to a career as muscle in the local gang of thieves (Background: Bradon Street Thug +2). Predictably enough, this career had a shelf-life, and eventually Targrin has the burning need to get out of town. He achieved this by enlisting with the Blue Riders Mercenary Company, one of the largest such outfits in the Havenscoast, specialising in caravan escorts westwards on the Traders’ Way across the Derghai plains to the Kurdar realms. For almost ten years he rode this route, becoming an experienced trail sergeant, as well as getting involved in numerous other missions and petty wars (Background: Blue Rider Mercenary +3). It was in one of these small engagements that he came into possession of his magical sword, from which his nickname derives. Finally he returned to Bradon after a six-month trip to find that his mother had passed away. Grief-stricken, his thoughts turned inwards and bitter, brooding over the ‘accident’ of his conception. Blaming his real (Orc) father for the trials and tribulations to his mother was subjected, he vowed vengeance. He returned to the northern borders of Camlan, taking every opportunity to undertake raids and missions against the humanoids tribes of the Barrens. Eventually he was asked to join the ‘Eyes’, the undercover special missions force of the Knights of Watch (Background: ‘Eye’ of the Watch +2; Icon Relationship – Positive 1). He volunteers for any dangerous missions going, as long as they give him the chance to one day achieve the vengeance he craves (Icon Relationship: Fire-Lord Asjarn – Negative 2). This entry was posted in 13th Age, Backgrounds, Columns, Content Corner, Icons. Bookmark the permalink.